for $420,000 with 5 bedrooms and 3 full baths, 1 half bath. This 3,586 square foot home was built in 1997 on a lot size of 4.5000 Acre(s). 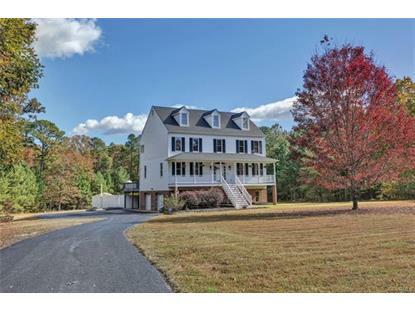 Stately renovated 5 bedroom/3.1 bath Colonial with an inviting front porch is located in Eastern Powhatan County on 4.5 sprawling acres! The main level is bright & sunny boasting rich hardwood floors, crown moulding & chair rail! Dramatic arched doorway from the foyer leads into the formal dining room with an ornate hardwood floor design & tray ceiling. Functional kitchen offers an island, wall oven & access to a laundry area convenient for everyday living. The oversized family room has a gas stone fireplace & gorgeous unique split stairway! Enjoy spending time in the vaulted breakfast area with a plethora of windows overlooking an oversized deck & an in-ground swimming pool! Master bedroom is spacious with a walk in closet & ceiling fan. Adjoining master bath offers dual vanities, jetted tub & a newly installed shower. Three additional bedrooms on the second level are spacious & serviced by a full bathroom. Full finished walk out basement offers a large recreational area, gas FP, full bathroom & a fifth bedroom or study. Other features include a walk up attic, security system, generator, fenced area & 2 car garage. You must see this immaculate well maintained home today! 288 to 60 West, Left on Stavemill, left on Dorset, left on Genito, right on W. Genito Blvd, right on Westwood Pine Drive.